Well that didn't exactly go as planned. And that pretty much sums up the Red Sox 6-4 Opening Day loss to the Tampa Bay Rays at the Trop. 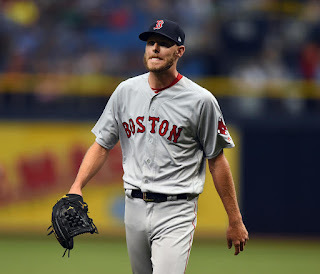 Sale (pictured) shut the Rays out for six innings allowing just one hit and three walks while striking out nine. Matt Barnes took care of business with a clean seventh inning. With Boston leading 3-0 in the bottom of the eighth, Joe Kelly walked the leadoff hitter, gave up a one-out RBI double and then walked two more to load the bases. Carson Smith came in and walked in a run followed one out later by a bases-clearing triple by Denard Span to give Tampa Bay a 5-4 lead. The Red Sox took a 3-0 lead in the top of the second inning on a run-scoring ground out by Rafael Devers and a two-run, inside-the-park home run by Eduardo Nunez. Devers double in another run in the seventh. Xander Bogaerts led Boston with three hits including a pair of doubles.